Then Simon Peter drew a sword and slashed off the right ear of Malchus, the high priest's slave. 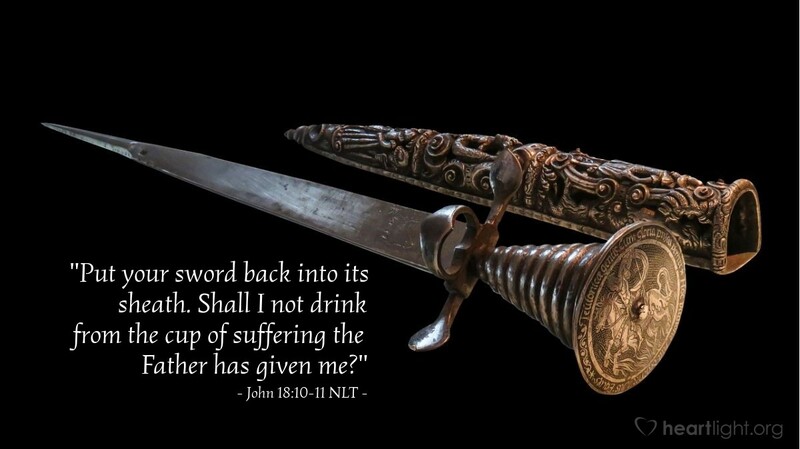 But Jesus said to Peter, "Put your sword back into its sheath. Shall I not drink from the cup of suffering the Father has given me?" Peter thought that the biggest battle would be a physical battle between the forces of Jesus and the forces of religious and political authority. He was wrong. The biggest battle was one of the will. Jesus had the authority to call down angels to slay his enemies. He did not ask for their help but instead offered himself up as a sacrifice to be our help. The battle was between Peter's earthbound vision of a worldly kingdom and Jesus' passion to glorify the Father by obeying his will. So often, we try to battle Satan with worldly wisdom and worldly weapons. However, our battle is with Satan's deceptive and seductive influence of our will. We need the power of the Spirit to win this battle. Do we choose to obey? Do we obey when we don't understand, or if it doesn't make sense? Is our apparent victory less important to us than our obedience to God? Jesus chose the will of the Father. Will we? Holy and gracious God, my Abba Father, I surrender my will to you to obey and honor you as you command. I offer my body as a living sacrifice to you. Use me as you so choose and mold my heart to be like that of Jesus, in whose name I pray. Amen.